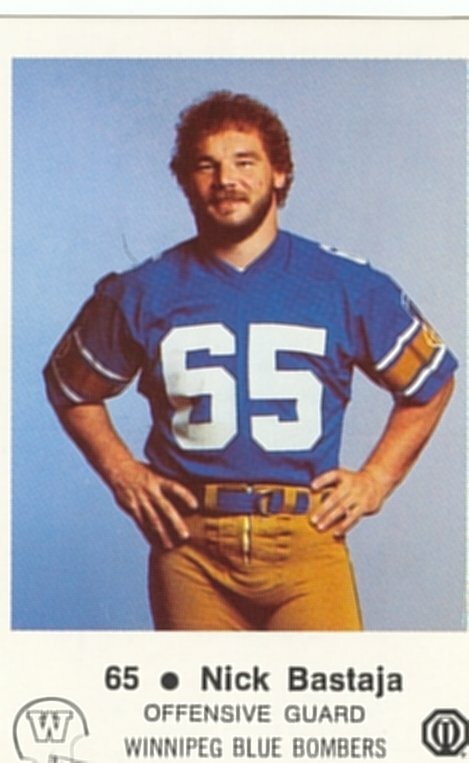 Bastaja was an outstanding offensive guard who played fourteen seasons in the CFL, from 1975 to 1988. Bastaja started his career with Hamilton in 1975 after being a territorial exemption by the Tiger-Cats in the 1975 CFL College Draft. After two seasons in the steel city, Bataja signed as a free agent with Toronto, and played three seasons with the Argos (1977-79). Bastaj won his first division All-Star honour in his final year in Toronto in 1979. Toronto traded Bastaja to Winnipeg where he remained for nine years (1980-88). With the Bombers, Bastaja wone five division All-Star honours, four in the West (1981, 1982, 1984 and 1985), and one East award (1987) when the Bombers moved to the East to replace the folded Montreal Alouttes. Bastaja also won two CFL All-Stars (1984 and 1985) and in 1985 was named the Oustanding Offensive LIneman in the CFL. Bastaja recorded one defensive tackle in 1987.